It's good practice. In my art class at the moment we are supposed to be learning and practicing compositions through grayscale to highlight the importance of shading and stuff. Siolfor the Jackal and The Sorcerer like this. cool cuz my vote would be to keep the gray GB pallette. EvanSki, Joe Ellis, JCJ and 7 others like this. Looks lovely and detailed. 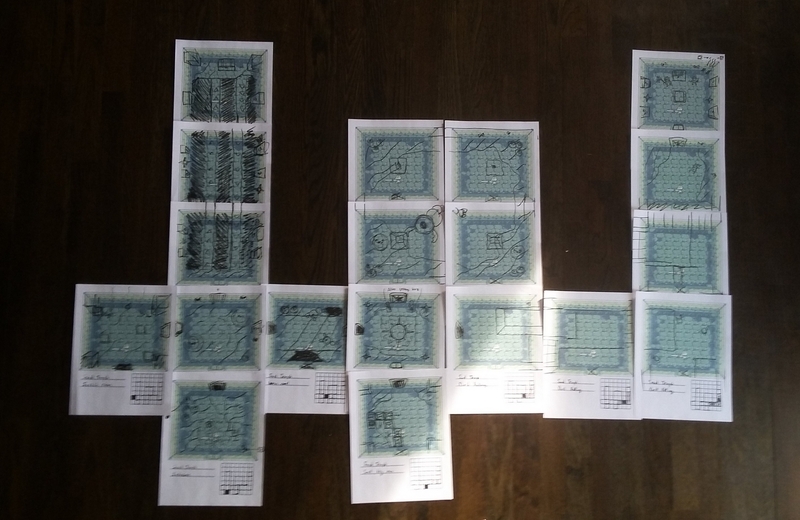 Although it's looping the tiles slightly, you have to stare quite a bit to see that it is actually looped and not all separate tiles. The lines on right side of the vases makes them a little hard to read against the background. Particularly in the lower right corner of the entrance. Not sure there's an easy solution, since putting the entire side in shadows would be too harsh, and you're out of color tones for anything else. Looks ok to me. Maybe shifting the vases left one pixel might help in that case. Not sure how that fits with the system that @RichHopelessComposer has got going on though. As in, if things are aligned to a particular grid or not. @The Sorcerer: yeah, I see what @CMAllen is saying a bit - I pushed pixels a lot to make them legible wherever they are, but with only three colors, of course you're going to lose some pixels to the background sometimes. I added the bounced lighting to the right side of the pots to help readability in shadows, and added the outline so that the left side is visible in the right. I'd be happy if I could get them even more readable, but I'm pretty happy with what I came up with. Besides, if they're in the shadowy corner, I think it's okay and realistic for them to be a little less visible - I don't think anyone will miss that there are pots down there, especially during actual gameplay. Edit: Ah, items are on a grid, yeah. 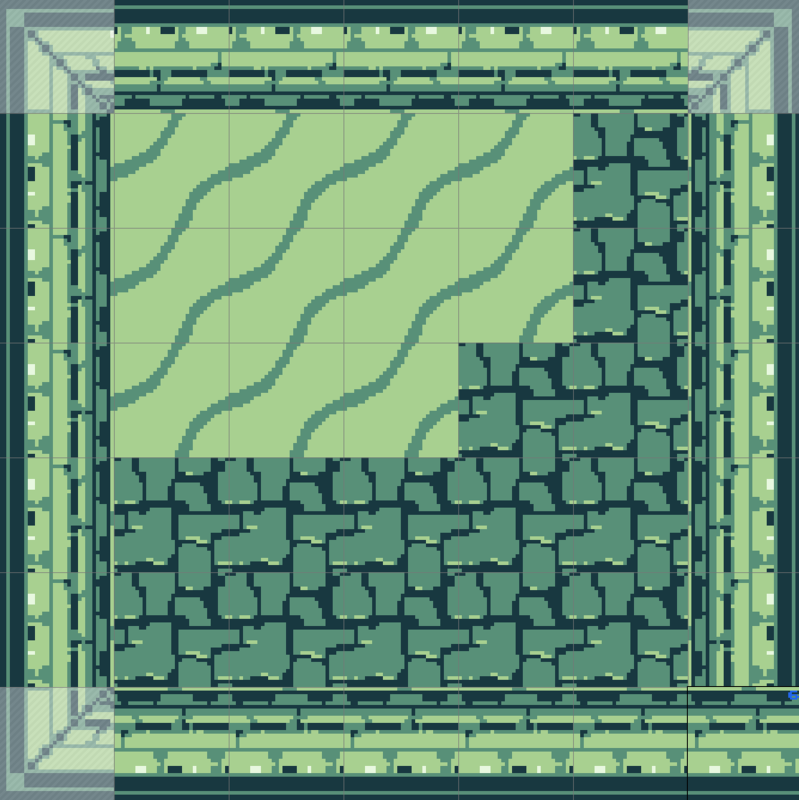 I could shift the jars over a pixel or two, but then I'd just run into other visibility problems on top of other tiles anyway, hahah. It happened constantly during this set, and is just a natural consequence of using so few colors - some things are going to blend together a bit. I think it's okay though, and I'm actually kind of liking that feature of this style. Kind of ambiguous where things start and end, which wouldn't happen with full color. If it were me, I wouldn't change a thing. 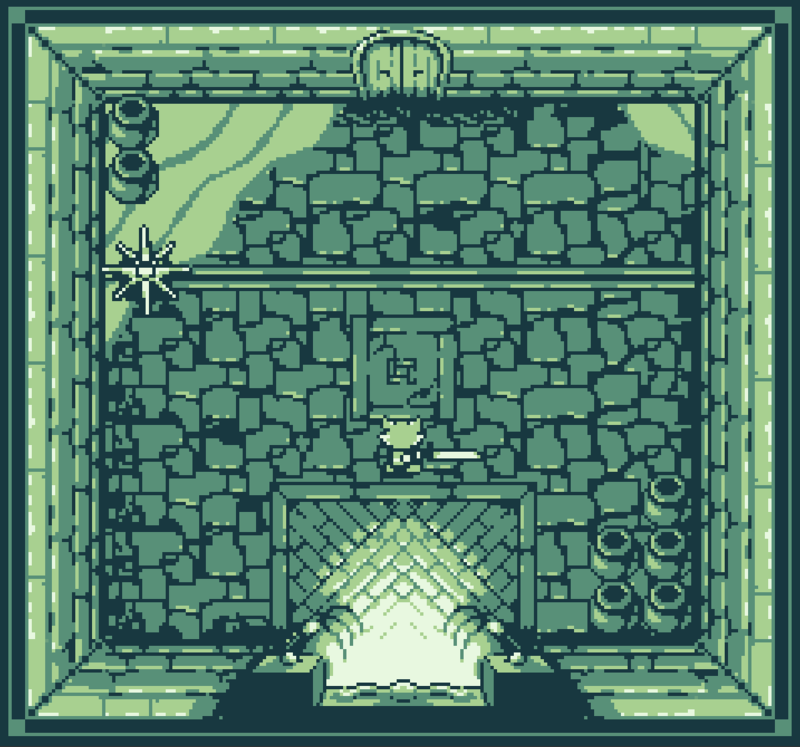 It might be possible to work in an optional toggleable "Gameboy Color" mode, if you used PixelPope's palette swap shader. In order to make it practical you'd have to come up with a relatively small overall color palette made up of 3-shade color gradients, but then you could draw all of your sprites with those colors, make a secondary palette where all of them are replaced with repeats of the same 3 green tones, and set the shader to draw over the application surface. Never tried anything like that myself, never had a reason to, but it "should" work. You'd have to do *VERY* slight variations of the three basic colors to get a color swap shader to work (using the additional color space like bit flags). Palette shaders function by way of comparing the source-image pixel color to all the colors on the source palette, and swapping the source pixel color to the color in the same position of the destination palette. If you only have 3 colors, then you can only swap to 3 colors. If you go look at the color test, you'll notice the fox has 4 colors instead of 3. Heh, you could make the DX mode a new game+ kind of thing. The way I'd do it would be just like a normal black/white shader... just assign the colored sprites new colors from the four available GB shades by checking their brightness. Unless I'm really screwing up my values while picking colors, it should work perfectly. I also already have a shader written that does palette swapping the normal way, which would also work fine, I think. So you would technically have the "same" three colors in multiple positions, and any sprite could use any or all of the colors in the left side, but all of them would effectively be displayed as their corresponding variant on the monochrome green. At least I'm assuming that would work, I could very well be completely wrong about how the shader reads colors and positions on the palette sprite. Now I'm starting to feel kind of silly for giving technical advice on the basis of "I assume that would work," but I already posed the idea, so I may as well clarify. Oh, I'm not saying you couldn't do it. But within the 3 color restriction on sprites, something like the colored version of your fox wouldn't work. It had 4 colors, which the 4th color is reserved for transparency, iirc. "That fox uses two sprites layered, like MegaMan did," heheh. CMAllen and Siolfor the Jackal like this. That's one (more work) option, too. Been there, done that, ended up hating it because of how much extra work it involves handling all those pieces. Granted, I was dealing with 8 different layers. That might have had more to do with it. I think it's gonna be awesome when it's done, though! JCJ, kupo15, CMAllen and 4 others like this. Pixel by pixel, frame by frame? The Sorcerer, Bearman_18 and kupo15 like this. If nothing else it definitely looks authentic! Sure you can. It's all about the approach. You have two different sine waves (simple curves, easy to control and animate) and a mod to those curves that creates the low level noise. Use the two curves to create a solid surface, then spawn animated particles along the curves to break up their form. Or, well, that's what I'd try, at least. It might not actually look all that great, so you may just end up being right after all. Of course, Blender's ability to animate particles is frustratingly limited. That's one of the few parts of Max that I miss. CMAllen and The Sorcerer like this. Yup. Did a quick test of the idea. It 'works' but it's not nearly as good as something more hand-crafted would be. Whoa, you tried it?! You're much quicker than me at that kind of thing apparently! The Sorcerer and Siolfor the Jackal like this. The parts are all separate, though I'm not certain about color limits. When exporting to a gif, it did only have 4 colors total. Needs more tweaking to image timing regardless, but like I said, it 'works' but it's still not as good as something more hand-crafted would be. Bladestorm Games, JCJ, Siolfor the Jackal and 1 other person like this. Niiice! For what it's worth, I think you did a great job here for something "automated." This honestly looks a bit better than I imagined. You handled the foam pretty well. Thanks for posting, though. Very cool!! As much as I love 2D graphics and animation, I'm getting more and more into finding interesting ways to make it look less "looped animation" and more dynamic. Micah_DS, Cloaked Games and The Sorcerer like this. Sounds pretty good, man. The melody instrument sounds a bit odd at one point with a long held note, you can hear the strong vibrato in it and it seems out of place to me. But yeah, fits the area nicely! Sounds pretty great, although I agree that the long notes at 0:45 and 1:30 can sound a little strange. Definitely think it helps build the atmosphere that you're going for with that forest though. Very much a tune you'd hear in an RPG from the SNES era. I think the vibrato sounded fine in the held notes, FWIW. Sounds great! I think the vibrato sounds great too and have no issues with it! Its the underlying bass repetition that causes it to stick out so much. That's my only critique, is that I think the arpeggios in the bass and harmonic progression (or lack of inversions) from :30 until the loop could be a bit more interesting. One example being the last arpeggio before the loop, why not do B>F#>A>F#>B>F#? I played Twilight Princess back on launch day in 2006, and haven't heard it's forest theme since then, because it didn't really grab me. I definitely didn't take any (conscious, at least) inspiration from that one, hahah! This song came out while I was noodling around on the piano one day. It's actually a Soul Healer piece I'm recycling for Maple Forest. The "real" version is a layered song that builds up as you get deeper into the area with some crazy counterpoint. My main inspirations for the Soul Healer version are probably Chrono Trigger and Secret of Mana (big surprise). The "full" version's counterpoint and instrumentation definitely has a Kikuta feel! The Sorcerer, Siolfor the Jackal and kupo15 like this. Haha well I guess its just a coincidence then You got it, think about it though. You could still keep your initial 2 bass notes, those are the main notes that will give it that droning effect you are after. I fear that with such a sparse texture, hearing that extreme repetitiveness on loop will become too monotonous. At the very least maybe explore shaping the volume of the left hand in way so that its musically more interesting than hammering all the notes at the same volume. At the moment, it seems a bit too much in your face instead of being blended a bit more. I'll study up on how to use Reaper more before tackling the next piece, and then I'll loop back around to this one to make changes after I'm not so set on how it sounds. After working on something for awhile, it's tough to decide on what to tweak without taking a break! The Sorcerer and kupo15 like this. kupo15, HayManMarc, O.Stogden and 1 other person like this. Yay, can't wait to see what it's actually like to play. I have to say it really does look like a gba game! 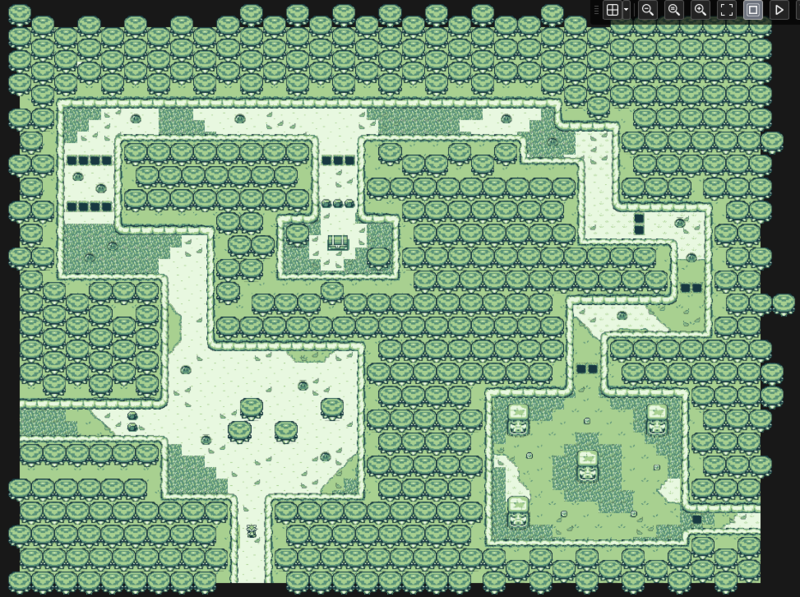 You're map is giving me nostalgic Route 1 vibes! Iz so gud! I just love the gameboy aesthetic! Brings back so many memories!